This is a wonderful take on classic flavors. 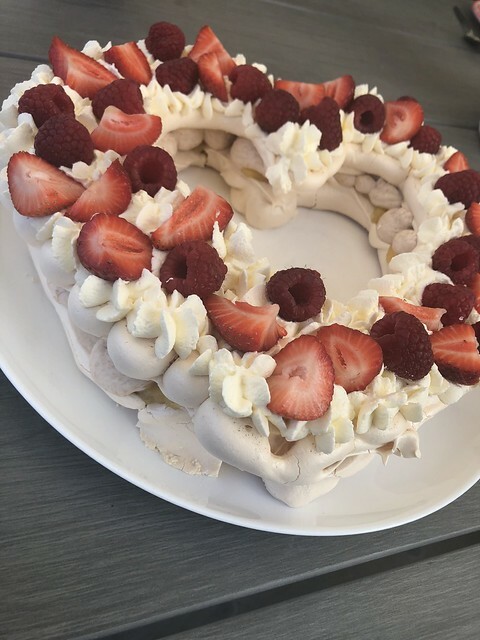 I was inspired by a super cute "number cake" I saw on Pinterest, and when Mother's Day was coming up, I decided to make a heart-shaped meringue cake, filled with rhubarb mousse, vanilla whipped cream and plenty of fresh berries. It has a layer of lemon curd as well, to add acidity and a little bit of sharpness. Wonderful cake! It generously served eight, and would have been enough for at least 12. Now, it's a little bit fiddly, I admit that - but you can prepare almost everything in advance. Make the meringue layers the night before if you have the chance, it's much easier that way. I also made the rhubarb jelly the night before, and then the morning of serving, I whipped cream, used a little bit less than half for the mousse and the rest for decorating. I really advice having piping bags at hand, it helps so much, and that way you can prepare everything, and have it ready in the fridge. Once you fill it, you do want to serve it fairly fast, as with all meringue-based cakes. Otherwise the meringue will eventually melt. But it holds up for at least a few hours! Beat the egg whites until fluffy - add the sugar and beat until you have a very strong and glossy meringue. Fill into a piping bag, and pipe your chosen shape on two lined baking sheets. Be aware that they will grow a LITTLE in the oven, so don't overdo it. You'll have enough for two fairly small rounds (about 8 inches/20 cm) or two larger shapes that aren't filled in, like my hearts. Bake at 100°C for about one hour. They will be pale beige, and should feel dry to the touch. Remove the sheets and let them cool completely before moving the layers - ideally leave them over night and only remove when you're ready to assemble. Whip the cream with the vanilla sugar - this can be made in advance. Fill in a piping bag, I used a star shaped nozzle for this. Place one meringue layer on a cake plate. Spread with lemon curd. Pipe rhubarb mousse all over. Place the second layer, and pipe cream all over that. 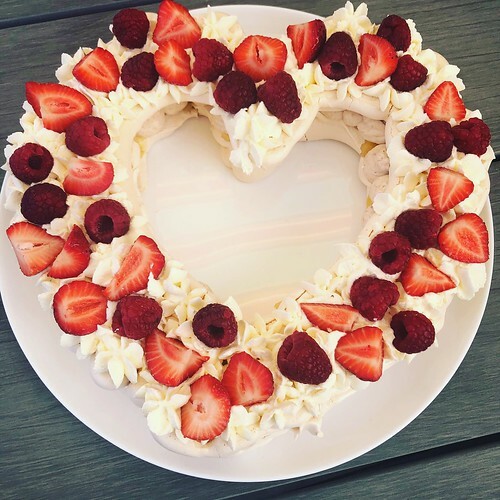 Top with all sorts of berries - you can also use flowers, or candy. There you have it - an amazing summer cake! I hope you'll like it!